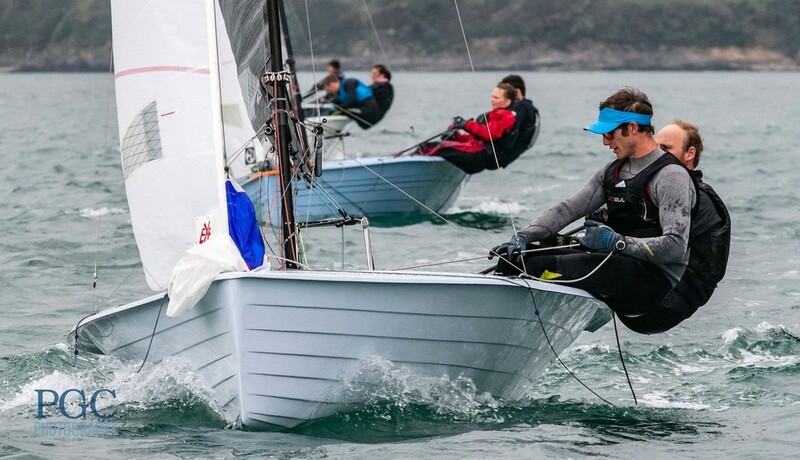 Christian Birell and Sam Brearey survived a final race show-down with Andy Davis and Pippa Kilsby to regain their Salcombe Silver Tiller title. Birell and Brearey (2,2) went into the final race one point behind Davis and Kilsby (2,1) after discards, and with Sam and Megan Pascoe (1,4), and Matt Biggs and Becka James (1,8) waiting to pounce on any errors by the two leading crews. But there were no errors. It was Birell and Brearey who lead from the front and never looked back to regain their title, with Davis and Kilsby chasing them home. Second to seventh was a good battle with boats switching places and ultimately deciding the overall standings, with Sam and Megan Pascoe clinching third, and Biggs and Becka James fourth tied on points with Tim Fells and Fran Gifford in fifth. The Melin Rocket Silver Tiller bandwagon continues to defy gravity with 60 Merlins for the Craftinsure Silver Tiller Salcombe YC event. This year they enjoyed an Easterly wind ranging from 2 to 25 knots and cold. Flat out reaching with the kite up to running to the leeward side of the boat and back again. It’s a long way across a Merlin. Whilst all this is happening there is always a boat right up the transom and you are about to head to a mark under Mill Bay where the last hours work can all be undone in 5 minutes. But all incredibly challenging and fun. Sailors keep coming back year on year to see if they can get that magic race or series in a fleet where even if you are racing round in the teens you can be racing round with national champions. And after racing the fleet can retire to the Yacht Club bar, which is one of the reasons why they come to Salcombe. Thanks to Salcombe YC for another great event, their sponsors of Salcombe Gin and Spinlock for the prize.